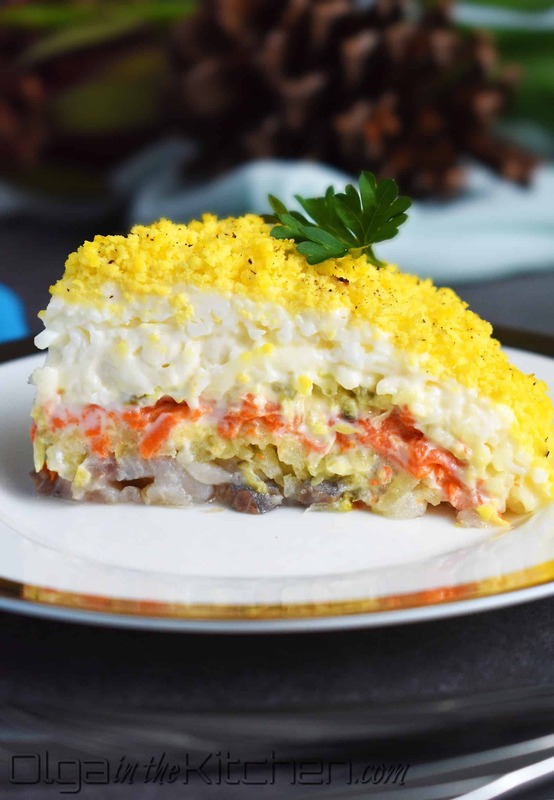 Mimosa Salad (Layered Egg and Cheese Salad): elegant, festive, appealing to an eye and delicious in taste! This salad is simply gorgeous! Everything is finely grated, every ingredient scattered equally throughout the salad making this salad look so decadent. 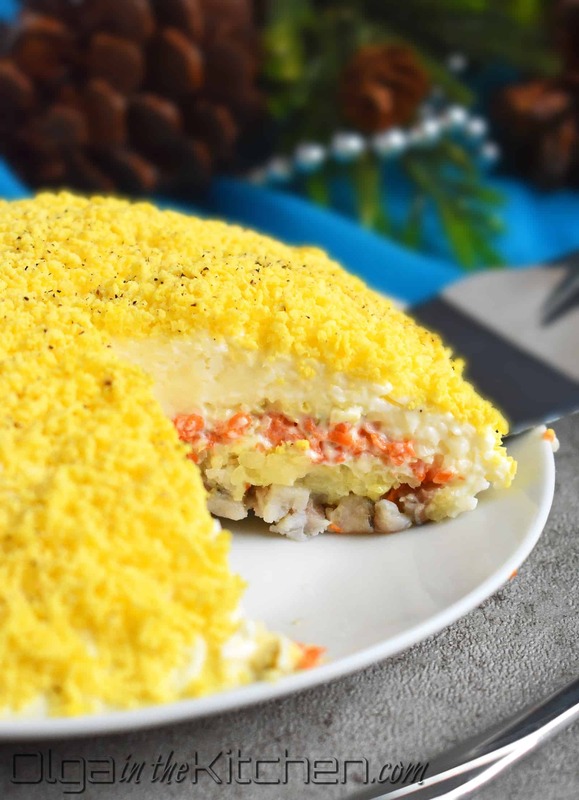 That elegant egg yolk finish just puts this dish over the top! 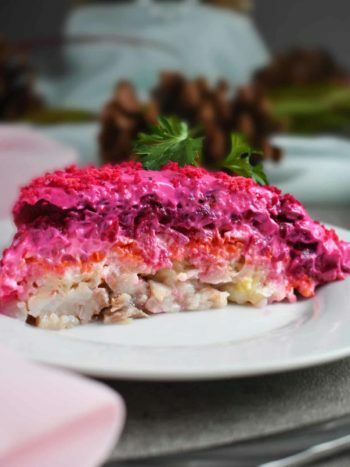 We had always used herring in this salad because we love the salty and tangy taste of herring in such salads. 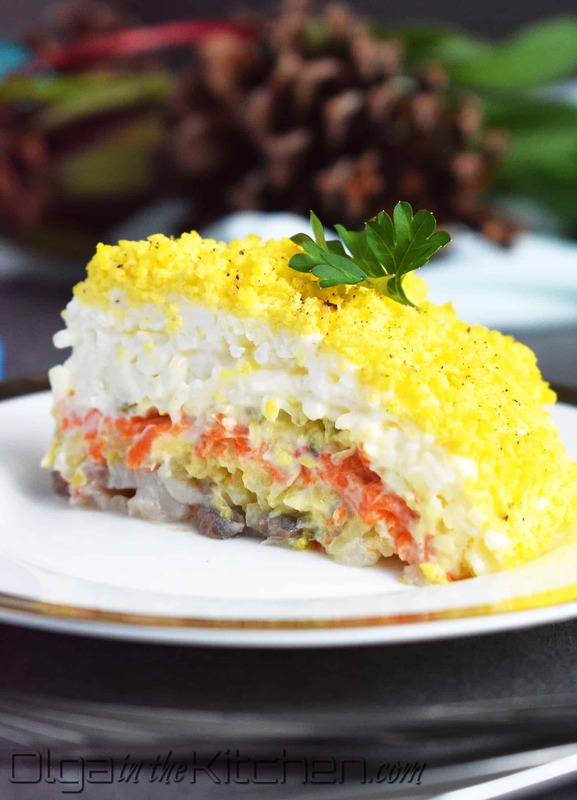 The main ingredients of mimosa are: cheese, eggs, fish, onion and mayonnaise. We also add carrots for a bit of contrast and taste, and little bit of pickles to make it less bland and bring a bit of tang to it. 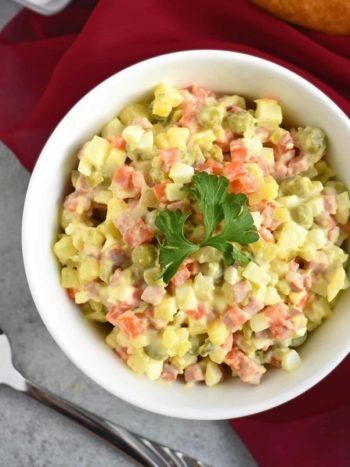 Mimosa salad had been a staple at our family at every major holiday, for as long as I can remember. I don’t know about nowadays, but when we were kids, people had mimosa salad as one of the dishes at every wedding. They would prepare it in small plates (smaller than mine), and feed 300-400 people at weddings. Can you imagine how many plates and how much effort people put into weddings back in the days? 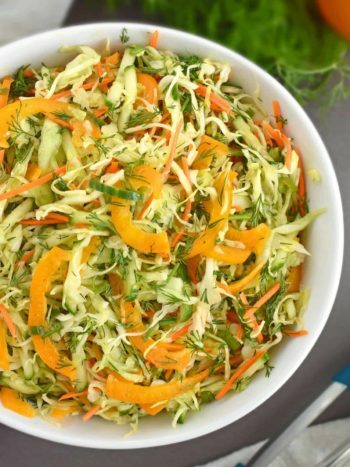 This salad is so easy to make, but a little timely, especially if you want it to look elegant and so perfect. Do not peel the vegetables. In a medium pot, place 1 medium Yukon potato and 1 medium carrot. Cover with water, bring to a boil over medium-high heat. Reduce the heat to low and cook carrot for 15-20 mins and take out with kitchen tongs or couple forks and continue cooking potato for 10 additional mins, until you can easily pierce potato with knife. Drain water and let the vegetables stand at room temperature to cool before peeling or refrigerate for faster cooling. Boil 5 eggs according to this post “Perfect Hard-Boiled Eggs” (click on link). 1. 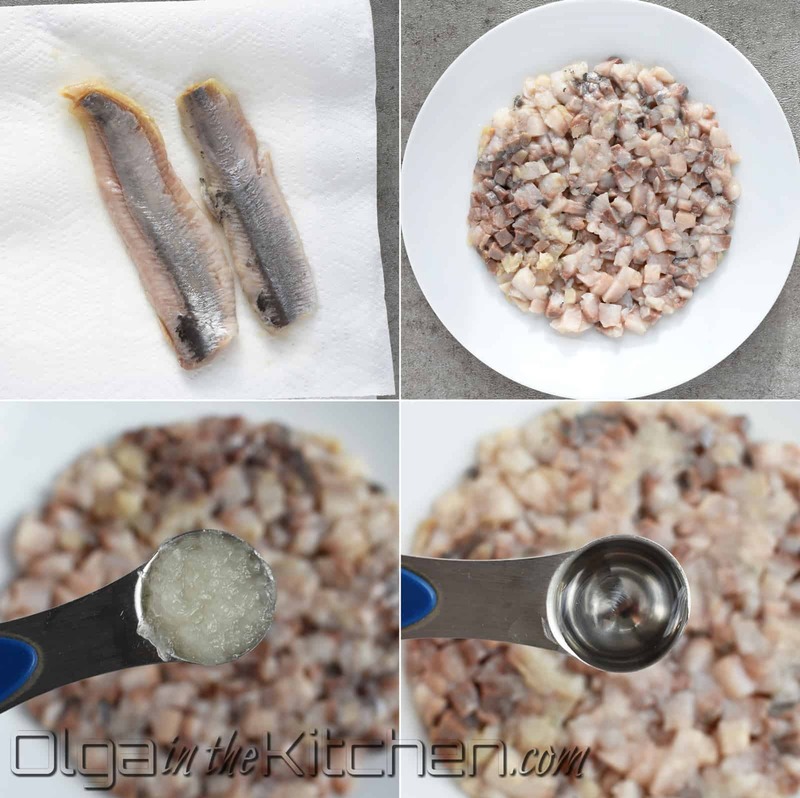 Take 2 herring slices from the package and place on a plate lined with paper towel. Pat herring with paper towel to remove excess oil. Cube herring into 1/4” cubes. In a 5-6” diameter salad plate, spread herring in circle in the center of the plate, pressing gently down with a fork. Drizzle 1/4 tsp white distilled vinegar and 1/4 tsp finely grated onion. 2. Using a cheese grater, finely grate 1 medium potato evenly over the herring and gently press down with a fork. 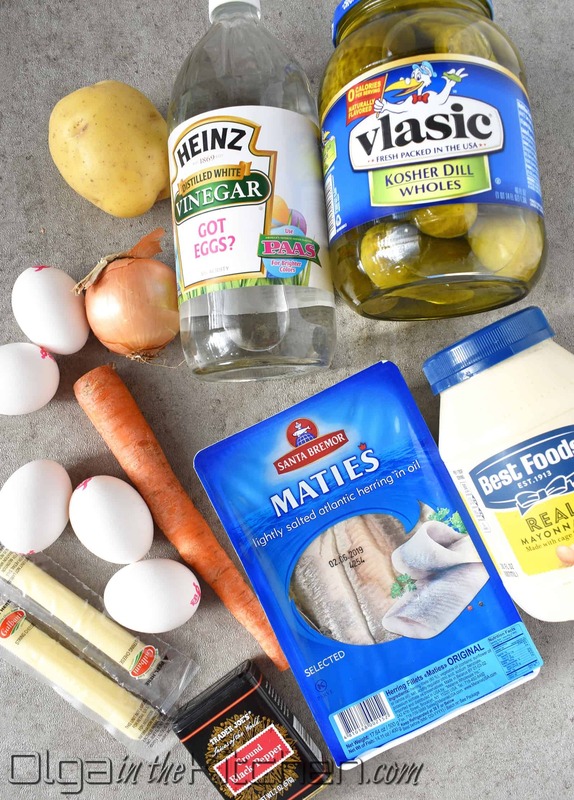 With a dull knife, spread 1 1/2 tbsp mayo over potatoes. Using same cheese grater, finely grate 1 medium carrot over the salad, press down with fork and cover with 1 1/2 tbsp mayo. 3. Into the sieve, grate 1 kosher dill pickle, squeeze out the juice and spread evenly over carrot. Cover with 1 1/2 tbsp mayo. 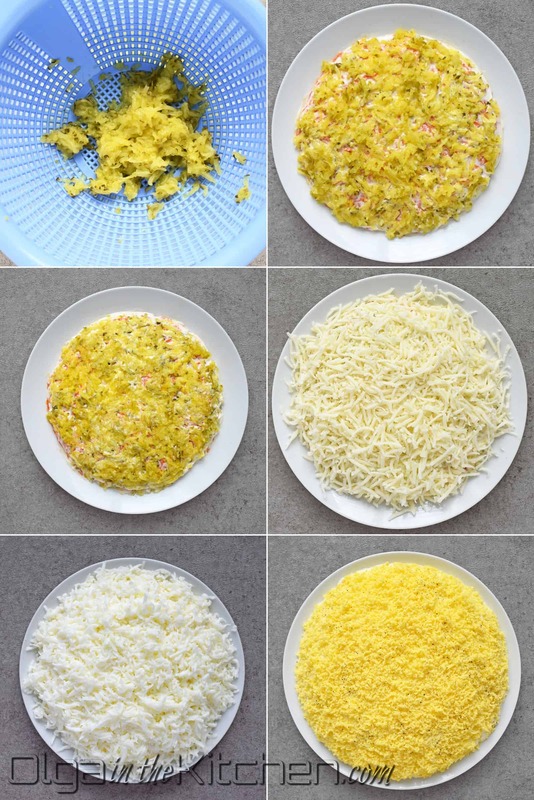 Grate 2 strings of mozzarella cheese onto cheese grater and evenly spread over the salad. Gently press down with fork and cover with 3 tbsp mayo. Separate boiled egg whites from egg yolks. Grate 4-5 egg whites onto cheese grater evenly over the salad. Press down with fork and cover with 3 tbsp mayo. Using grater, top with finely grated 3-4 egg yolks along with fresh parsley and sprinkle with ground black pepper. (Be very gentle with egg yolks so you don’t squeeze and mash them. 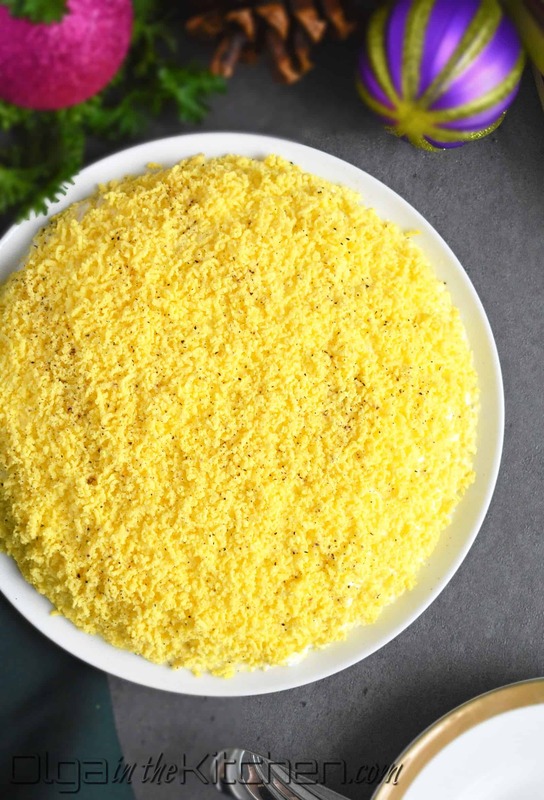 You want the grated egg yolks to fall onto mimosa like snowflakes). Cover with plastic food wrap and refrigerate until ready to serve. 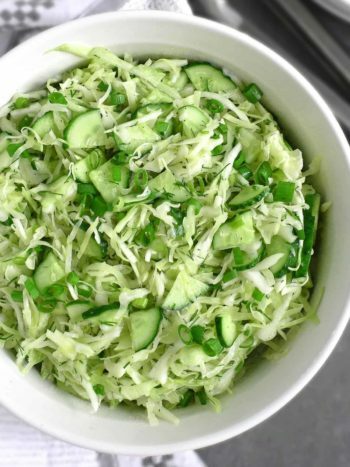 This salad is good refrigerated for 3-4 days. 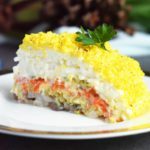 Mimosa Salad (Layered Egg and Cheese Salad): elegant, festive, appealing to an eye and delicious in taste! Cook the vegetables: do not peel the vegetables. In a medium pot, place 1 medium Yukon potato and 1 medium carrot. Cover with water, bring to a boil over medium-high heat. Reduce the heat to low and cook carrot for 15-20 mins and take out with kitchen tongs or couple forks and continue cooking potato for 10 additional mins, until you can easily pierce potato with knife. Drain water and let the vegetables stand at room temperature to cool before peeling or refrigerate for faster cooling. Boil 5 eggs according to this post “Perfect Hard-Boiled Eggs” (click on link). How to Make Mimosa Salad:Take 2 herring slices from the package and place on a plate lined with paper towel. Pat herring with paper towel to remove excess oil. Cube herring into 1/4” cubes. In a 5-6” diameter salad plate, spread herring in circle in the center of the plate, pressing gently down with a fork. Drizzle 1/4 tsp white distilled vinegar and 1/4 tsp finely grated onion. Using a cheese grater, finely grate 1 medium potato evenly over the herring and gently press down with a fork. With a dull knife, spread 1 1/2 tbsp mayo over potatoes. 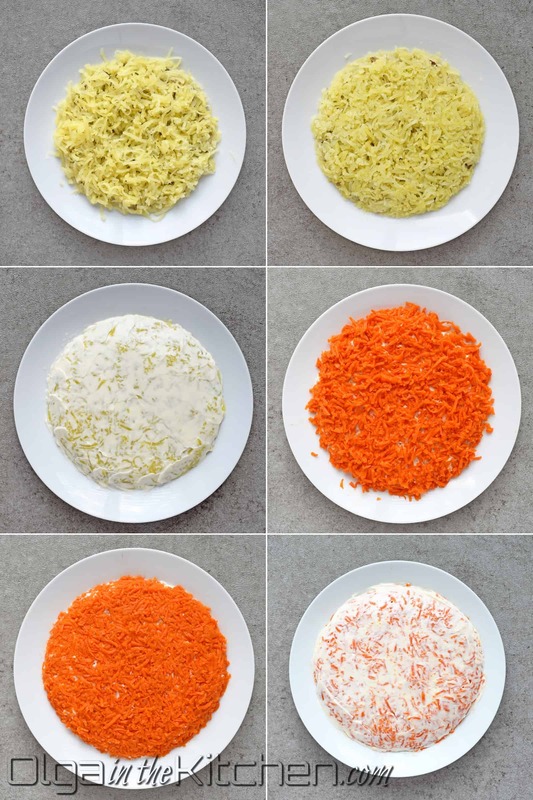 Using same cheese grater, finely grate 1 medium carrot over the salad, press down with fork and cover with 1 1/2 tbsp mayo. Into the sieve, grate 1 kosher dill pickle, squeeze out the juice and spread evenly over carrot. Cover with 1 1/2 tbsp mayo. Grate 2 strings of mozzarella cheese onto cheese grater and evenly spread over the salad. Gently press down with fork and cover with 3 tbsp mayo. Separate boiled egg whites from egg yolks. Grate 4-5 egg whites onto cheese grater evenly over the salad. Press down with fork and cover with 3 tbsp mayo. Using grater, top with finely grated 3-4 egg yolks along with fresh parsley and sprinkle with ground black pepper. (Be very gentle with egg yolks so you don’t squeeze and mash them. 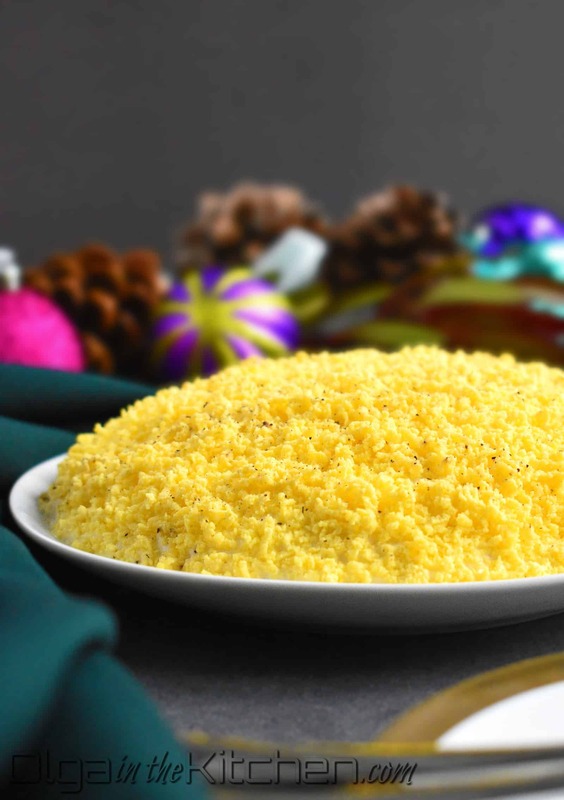 You want the grated egg yolks to fall onto mimosa like snowflakes). Refrigerate until ready to serve.